Where were the people gathered? If it’s anything like my house, no matter the occasion or how many people are present, people end up near the kitchen. Is that a Southern thing? Or a New Orleans thing? Or is it just because down here, our world revolves around food? Either way, the premise holds true that the way to the heart is through the stomach and the way to the stomach starts in the kitchen! 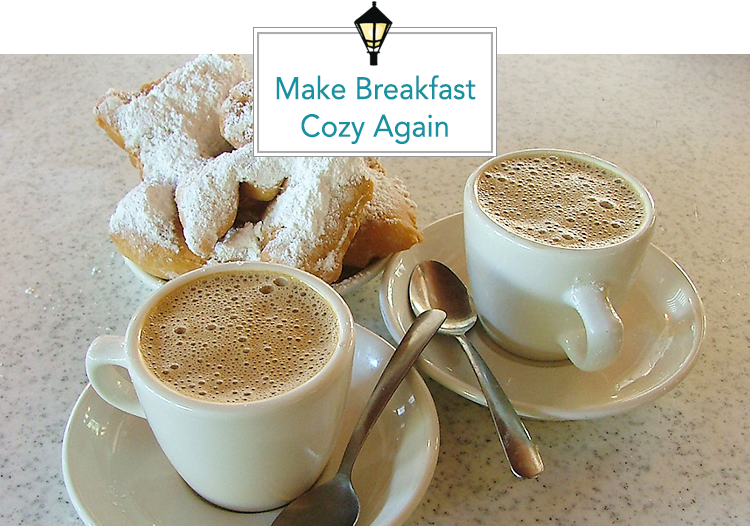 Let’s look at simple ways to build a better breakfast nook! Less is more… True in most areas of life, this is certainly accurate when it comes to your kitchen. Overflowing silverware, pots, and pans pouring out of the cabinets, etc. Clutter can quickly pile up in your kitchen. Let’s change that starting with your nook. Like moving equating to a good time to purge unused items, a breakfast nook project is a good time to create some space. 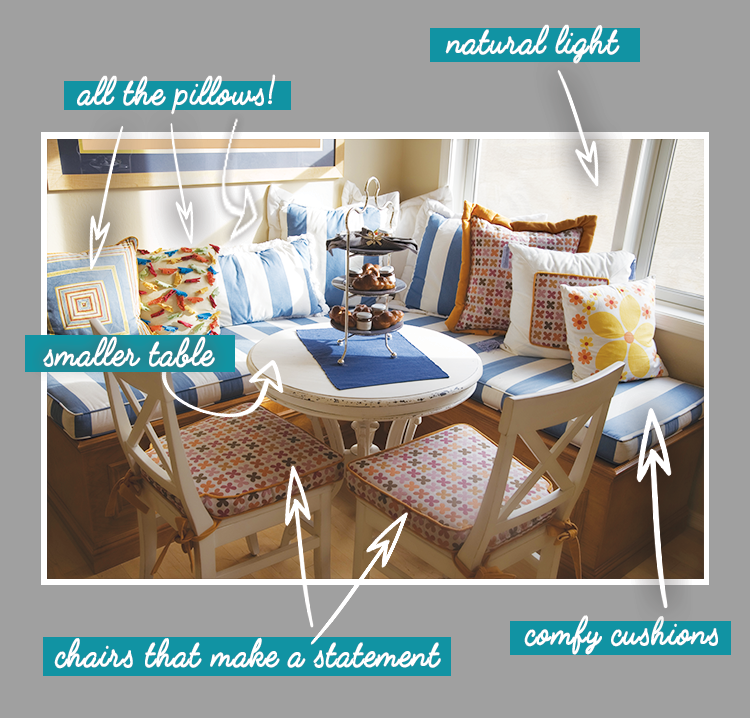 Your breakfast nook will be a place for relaxation, so let’s clear the area of clutter and stress! Speaking of less…the table is your main culprit when it comes to eating up space. If possible a.k.a you don’t need a ton of seats or you have another larger seating area, let’s try to replace the bulk with a smaller, sleeker table. You can even try tall tables that are usually serve as side tables or entryway tables. For the table, size is the end-all-be-all. 29-30″ tall is the ideal amount with at least 36″ from each outer edge of your nook as “this is the minimum clearance for chairs to comfortably scoot in and out,” says Katie Hodges of cupcakes and cashmere. Chair is the love? In a space made to be cozy, comfort is king. So, let’s make sure your nook is actually somewhere you want to spend lots of time. Your first seating option is dining chairs. Since this is what you will see first, it’s important to pick chairs that look especially good. Uniformed or mismatched, you can find your style at antiques or flea markets around New Orleans. Speaking of customization…a breakfast nook is a blank canvas on which you can spread a heaping dose of creativity. It starts with your color scheme. Whether you like bold colors and patterns or softer, more muted hues, pick a side and stick to it! Pick 3-4 colors and choose different shades of each as you pick out cushions for the bench and the chairs if you’d like. Oh, and the pillows. Oh yes…the pillows! We’ve mentioned the word cozy multiple times, and the pillows are your vessel to cozy town. A various mix of designs and patterns can really tie everything in together. Stripes and vintage designs are really in-style right now, but anything you like can ultimately be made to work! So that’s four simple steps to make your breakfast nook your new favorite gathering place. Clear the clutter, choose a smaller table, pick the chairs and bench and add your style. This is the recipe for coziness!